Rabbi Eli Baruch Shulman serves as a Rosh Yeshiva at RIETS, holds the Rabbi Henry H. Guterman chair in Talmud, and is the rabbi of the Young Israel of Midwood in Brooklyn, NY. He received his rabbinic education in the yeshivot of Mir, Lakewood and Beis Yosef. He is the author of eight seforim: Binyan Av, and Yesamach Av (6 vol.) and a commentary on the Haggadah. He also served as an editor of the Schottenstein/Artscroll Talmud. 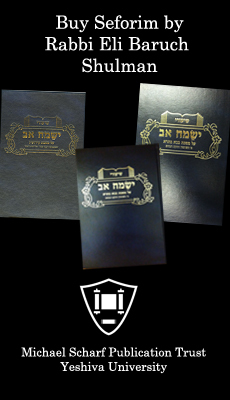 To purchase Rabbi Shulman's seforim (books), please click here. Modern Orthodoxy: What's in a Name?